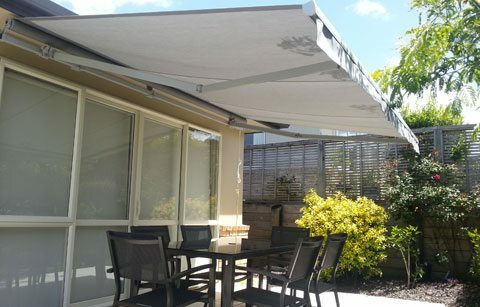 Many of our clients live outside the Greater Auckland region but still want the high quality performance of Total Cover Shade and Shelter Awning and shade products. If that’s you, we can offer our product range on a supply only basis. Send us pictures, measurements and any other information you have and we’ll consult with you via telephone or email. We’ll supply everything you need to install it yourself – product, brackets, fixings and installation guide. Warranty conditions apply. E-Commerce site coming soon. This is our standard German engineered retractable awning. The most affordable classic model available yet still made from premium aluminium componentry and covered with 100% European canvas which comes with a 5 year warranty*. Silver Pearl – Soft to the eye and very modern will suit most homes. Appliance White – Imagine the same white as a household appliance – a clean crisp white. Choose from one of 6 modern colours from our European canvas range. We highly recommend a pelmet cover for exposed awnings which are mounted to a wall. Please note if you are mounting under a soffit there will be no need for a pelmet cover. Your awning can come with a set of wall brackets or soffit brackets. Buy and collect from our factory located at 8B Piermark Drive, Albany, Auckland. Have it sent direct to your home ready for installation. Freight cost will apply*** estimated between $250.00-$300.00 incl gst.